Looking for news content around the holidays? We can help. You’ve got more holiday feature writing to do, while you watch your colleagues start off on their vacations. This annual deadline doesn’t always lead to your most creative writing. Thankfully, you’ve got a place to go: Start with the advance search tool on PR Newswire for Journalists and fill those empty spaces on your website with compelling content. Keep these five things in mind, when readying your news site for the holidays. Thanks to content marketing, news releases have become great vehicles for storytelling. Marketers and publicists know you’re pressed for time and low on staff through the new year, so they’re making releases easier than ever to use. Many releases come with art or graphics. Stop searching for high-resolution images and/or videos – many of our releases come with multimedia elements, making them easy to upload. Feel free to publish photos, logos and videos without worrying about copyright issues. Everything on our newswire is fair game for use. 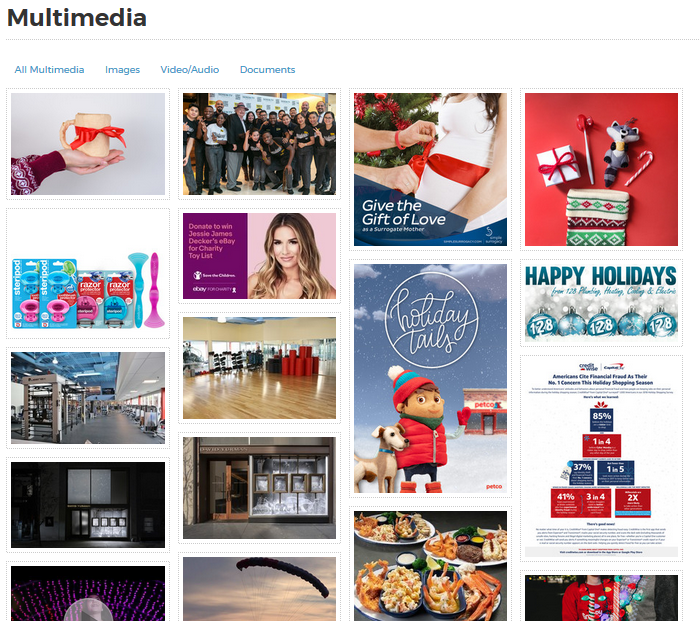 Here are just some of the images you might find, if you search the word “holiday” in our multimedia section of PR Newswire for Journalists. The unbelievably destructive California wildfires have been on everyone’s minds. Just around Thanksgiving, CNN reported smoke from the California fires was visible across the country in New York City. The Camp Fire in Northern California now is 100 percent contained, though it tragically killed 85 and burned more than 153,000 acres. Roughly 14,000 residences have been destroyed. Now, about that evergreen copy. Say you’re a magazine and you’ve already closed your holiday gift-giving guide or round-ups months prior. You likely must continue updating your website. So unless a major news event occurs, you’re probably still recycling the same ideas, tweaking them a bit, and adding a 2018 or 2019 label. Need to follow up? That’s easy. OK, so the newsroom’s quiet and you have more than a minute to complete the task of updating the site. You decide to make a few calls to add to and/or change some of the site content. Finding a source to interview isn’t hard. Every release that crosses our newswire comes with a media contact at the bottom of the release. Email and phone numbers are standard, and these folks are ready for your questions. Finally, if you’ve not already tried our ProfNet or HARO services, give them a try. There are thousands of sources available for interview at any time. Note: This post is an updated version of a post that originally appeared on Beyond Bylines in Dec. 2016. Christine Cube is a senior audience relations manager with PR Newswire and freelance writer. Check out her latest on Beyond Bylines or follow her at @cpcube. Evergreen content is at your fingertips. Cure those holiday writing blues with these tools.